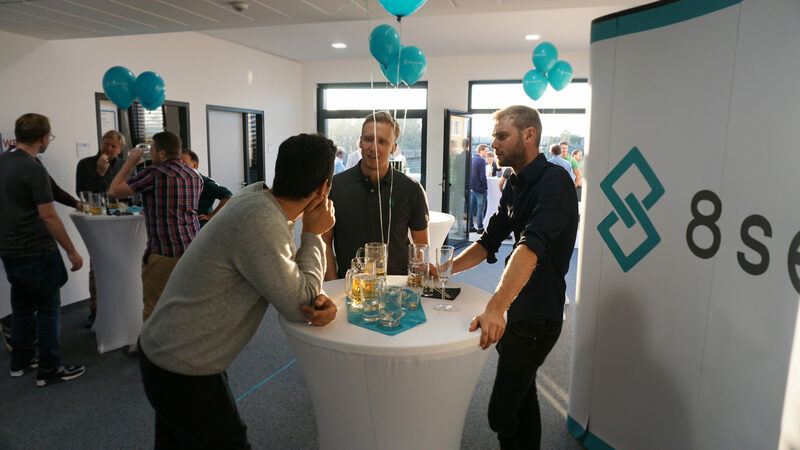 Last Friday, 7th September 2018 the start-up center Stellwerk18 was festively opened by major Gabriele Bauer, CSU-Landtag delegate Klaus Stöttner and the Bavarian minister of economic affairs Franz Josef Pschierer. The new start-up center is located close to the train station in Rosenheim and is supported by the city and county Rosenheim with financial means of 3.2 millions. The Stellwerk 18 provides start-ups in the field of digitization with cheap office space and assistance in building a start-up. 8sense and eleven further start-ups moved now into the new building. One week later there was an internal housewarming party in the 8sense offices. Together with families, friends and business partners 8sense said cheers to the new offices. Our two founders Ralf and Christoph presented our company to all guests in the conference room. Moreover, all interested people were invited to learn more about our product, the 8clip and our different coaching systems better sitting, better training and better lifting. Afterwards everyone was free to network in a relaxed atmosphere enjoying drinks, snacks and a DJ. The aftermovie will be published soon on our social media channels.